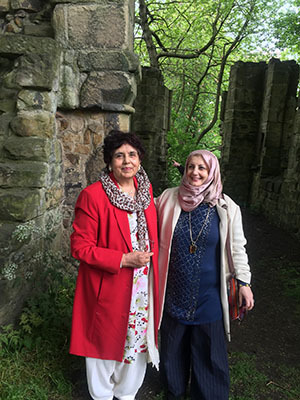 The annual Diocesan Christian/Muslim Women`s event to 'Pray for Peace' took place at the ruined chapel to Our Lady, Jesmond on Saturday 20 May. The biggest turnout to date of Christian and Muslim women and children in equal numbers attended the 'Pray for Peace' event sponsored by the Diocese of Hexham and Newcastle. 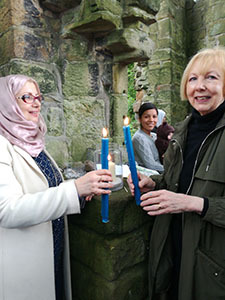 Over 70 joined in the re-vamped service at Our Lady's ruined chapel in Jesmond Dene, Newcastle-upon-Tyne on Saturday 20 May. One Muslim woman said, "I brought my daughter just to show her how people can bond. There doesn`t need to be malice." A Christian woman said, "It's wonderful the fact we have all gathered together for prayer." Yasman Qureshi from Heaton commented, "The occasion was very well organised and a lot more people turned out this year than the last two which I attended. The purpose of this gathering is great and has always been close to my heart. Creating an understanding between Islam and Christianity is so much required at this time as the politicians and Muslims themselves have exploited the negative views about it and misused it for creating havoc of war and dreadful misunderstandings. We know for a fact that the two religions are like brother and sister as they believe in one God and the same God at the end of the day. I enjoyed the last prayer sung by all, make me an instrument of peace. It carried the message of both parties beautifully. The sharing of the candles is an attractive way of highlighting it too." above: Yasman Qureshi and Hengameh Ashraf Emani. After the prayers refreshments were provided at then nearby Holy Name parish centre. A Muslim woman said, "It's my first time and a very interesting experience. It's a good environment so I can actually have a 1-to-1 conversation with people who are ready to listen." Two Christian women said, "A lovely idea. I've met some very nice ladies I would never have spoken to before." and "A lovely event for women coming together from all backgrounds and religions." During refreshments Christine Wickens and Mary McLoughlin explained the Rosary and Hengameh Ashraf Emani explained the equivalent in Islam; the Tasbih. Hengameh has been helping with this event from the beginning. She is doing a PhD on British Muslim women at Northumbria University. She and Hazel Jones-Lee, who has also taken part from the beginning, exchanged candles during the event to begin the sharing of the sign of peace among those gathered. Hazel is a parishioner at St. George's, the local Anglican church. left: Hengameh Ashraf Emani and Hazel Jones-Lee swap candles as a sign of peace. The Rev. Catherine Lack from St. Thomas', Haymarket wrote later, "I am really pleased to have attended this event. It was the first time, although I'd known about it for a few years. I work with Muslims and Christians in my work in Newcastle University and in the centre of the city at St Thomas'. The two policewomen at the event were really impressed. It was an excellent event and shows how things can happen really creatively, with a little bit of planning and a lot of prayer. See you next year!" This has always been an ecumenical event as well as an inter-faith event arranged by volunteers who have worked very hard over the years to promote the occasion, which is unique in the UK. It also attracts women of no faith. This year Sr. Agnes from Stanbrook Abbey now at Wass, Yorkshire joined the event. Sr. Agnes is doing a PhD on Christian - Muslim relations. She recently visited a mosque at Whitley Bay and met the Imam. A collection totalling £178 was sent to Mary's Meals. A representative for the charity sent an enthusiastic letter of thanks.